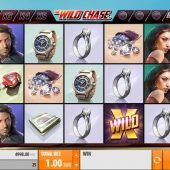 The Wild Chase slot assails your ears with dramatic music as soon as you open it up, because a tense pursuit is what it's all about - yes, there's diamonds and other trappings of wealth on the reels but the objective for you is chasing those Wilds! The game is set against a wealthy coastal resort, possibly Monaco, and the reels have a re-spin format similar to that of Thunderkick's Barber Shop or Netent's Jack Hammer. 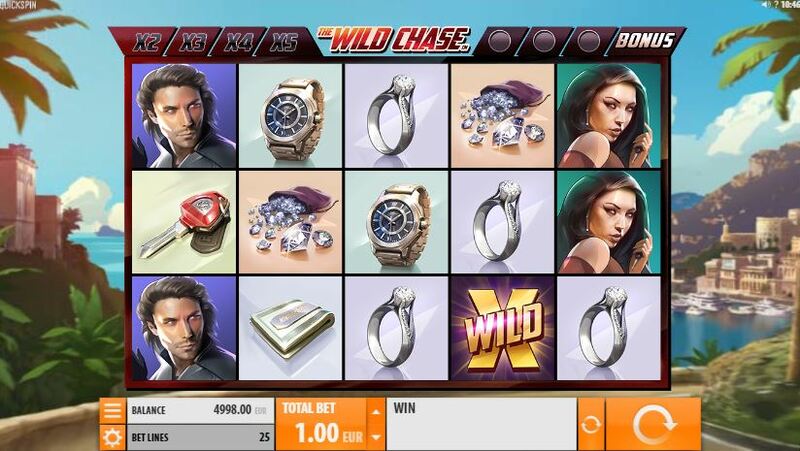 So far very promising, but will the Wild Chase be relentless in its pursuit of our bankroll? We have 25 pay lines over the standard 5 reels of 3 rows each but all positions are separate reels which spin individually. Any symbols can appear in any position so stacks are common and as said any winning combinations freeze while the rest of the unused positions spin, until no more winning lines are added. The 5-of-a-kind pays aren't great because you usually get multiple lines, the best is the red character with a startling resemblance to ex-footballer David Beckham at 2x, the redheaded lady at 1.6 and other two characters offer 1.2x each for the 5. The diamonds, wallet, watch, ring and car key all pay from 1 down to 0.6x for a full line. You may be wondering where the Wilds come into things, and here we go. When they appear as part of wins and thus freeze on the reels you get a multiplier applied to the screen when the round is complete. A single Wild pays 2x, two will pay 3x, three 4x and four or more 5x for all wins on the screen and not just the lines they are part of. You get bonus symbols appearing on the grid and these will disappear when wins are frozen, but there is a meter above the reels and if all 3 drop in at once, or you build up a total of 3 or more during the re-spins in any one game then you trigger 10 free games. During these free games which cannot be retriggered, a Wild is placed into a random position on the grid to enhance winning chances. The same multipliers apply as in the base game.